Greece. What mental images does the word conjure-up? Ancient ruins, the Acropolis, Delphi, Corinth; clear blue Mediterranean seas with a backdrop of sandy beaches, rolling hills and mountains; picturesque villages; healthy salads; plus sun, sun and more sun? Pretty accurate. The country doesn’t disappoint, especially in summer. I confess though, summer is the only time I’ve visited. Arriving mid-year gives a hint of the climate to be experienced in other seasons. Overcast or patchy cloud, some rain, but rarely constant. Enough sun for life to be enjoyable, and I suppose for those from a temperate climate, a pleasant temperature. Me? I like it hot! And hot it can be. Low to mid 30s, occasionally higher. I have experienced 42deg C, which to be honest is too hot for anyone. But such highs are rare. But let’s not forget the mountains are high. More than two thousand meters in places, and they catch considerable snow in winter. Villages like Delphi, which swelter in the mid-thirties during summer, are in fact skiing villages during winter. But that adds to the charm. Many of my travels have a motorsport component, and the June trip to Greece this year was no exception. The Acropolis Rally is a round of the World Rally Championship, and if you want to see rallying at its best, a WRC event is not to be missed. The Acropolis ranks as one of the all-time greats. Travelling with a friend who had never been west of Malaysia, gave me a different perspective on what southern Europe has to offer. Sadly, Europe and Southeast Asia are not close, but we managed to get an excellent connection on Qatar Airways, via Doha, which made the KL to Athens time only thirteen hours. That’s a long time, but it’s bearable, especially when it’s not overnight. Loutraki from the entrance to the Corinth Canal. Our first destination was Loutraki. That’s about 90kms from Athens, slightly more from the airport, but with the good expressways, it can be covered in about an hour. Unlike some countries, the toll is not excessive. To be honest, there’s not much to be said about Loutraki. We picked the place because the rally HQ was there, plus the Service Park. Apparently the town was devastated by an earthquake a couple of decades ago, and was hastily rebuilt with modern concrete hotels. It serves as a retreat for Athenians, making parking difficult on weekends. But, the waterfront area is nice, and it has a wide variety of restaurants. The views out to sea are spectacular, so for a few days, it’s a quite acceptable place to relax. 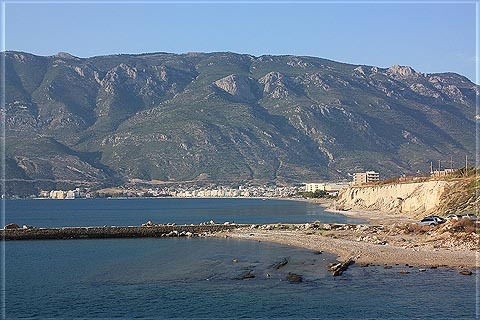 Loutraki does have surrounding attractions. It’s close to Corinth, which although an ancient city, seems to have no more to offer than a canal. Certainly this is a “must see” and we managed to take an evening cruise through the 6.4 kilometer channel. The late afternoon temperatures are cooler, especially when shielded from the sun. My friend had the good sense to bring a jacket. Also, the evening shadows offer excellent photo opportunities. It made me realize what cost savers digital cameras can be. Take a hundred photos, scrap ninety, and not worry about processing and printing costs. 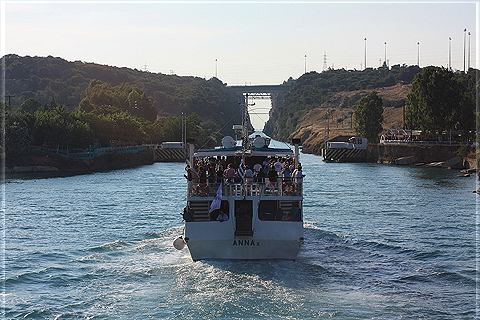 Wikipedia notes that due to its width, the canal now has “little economic importance.” Tell that to the operator of the boat we travelled on! European tourist fees can shock at times, but it was an expense that was well worthwhile. 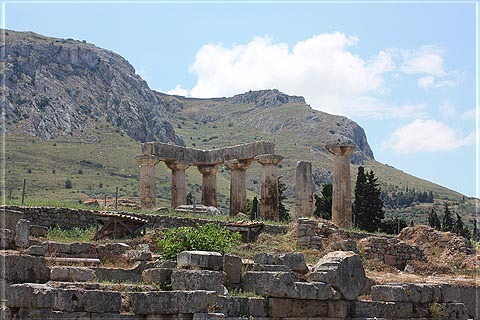 What we expected to find in Corinth but didn’t, was compensated for by a visit to Ancient Corinth. This is not exactly adjacent, but needs an other trip down the expressway, heading away from Athens, and then a short journey on rural roads. You have to be persistent to find the parts that are worth seeing. The ancient ruins and the pretty village are well hidden behind the residential areas, the whole town being devoid of any kind of tourist sign boards or directions. I seem to remember there was one for someone’s guest house and campground, but no useful arrow indicating “Good Stuff This Way”. But persistence pays off. The place is a gem. I’m not a great fan of ancient ruins. I see one every morning as I wander naked from the bathroom and glance in the mirror. The ones in Greece are even more ancient, and decidedly more ruined. It’s left to one’s imagination to reconstruct piles of old rocks into palaces. dwellings and arenas. At most sites there’s a museum, where, in exchange for several Euro you can see artists impressions of what places might have looked like two thousand years ago. I was thankful that the museum at Ancient Corinth was closed for the day, due to a general strike of government workers. So why, you are wondering, would I call the place “a gem.” It’s the whole atmosphere. The remaining white columns stand next to tall, slender, dark green cypress trees, with distant sea views and mountains beyond. The warmth of the sun and clear blue skies give one a feeling of peace, in such spectacular surroundings. And I haven’t really mentioned the adjacent village. Not much more than one narrow street, which really should be a pedestrian-only thoroughfare but isn’t. It has the usual stores crammed with “genuine” Greek gifts, quaint restaurants and ice cream stands. But nothing is ostentatious. You don’t get accosted on the streets by touts telling us which are the best souvenirs or places to eat. You can shop, you can eat, or you can just enjoy being there. We did all three.